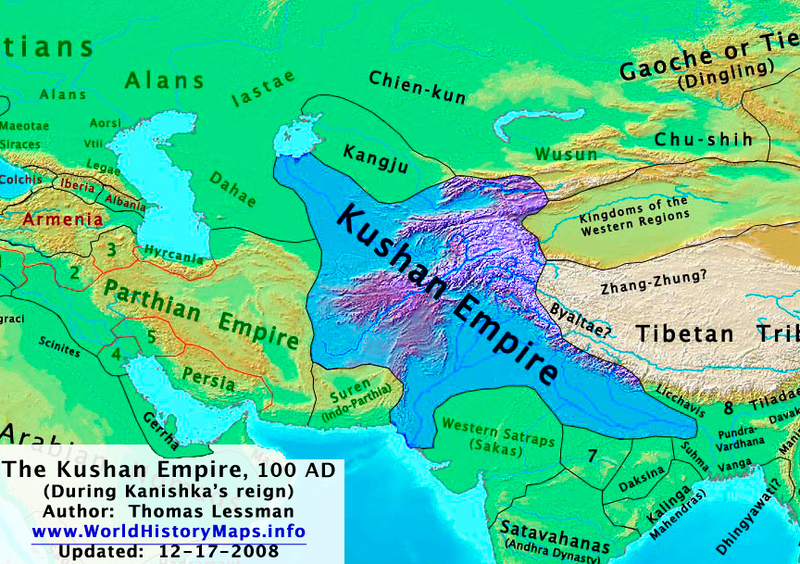 The Kushans, originally one of the tribes making up the Yuezhi people, had by now developed a very powerful kingdom in what's now Afghanistan (capital at Kabul), Pakistan (capital at Peshawar) and India (capital at Mathura). They were an Iranian people (probably), who once occupied territory in Turkestan or Mongolia. In the 2nd century BC, under pressure from the mysterious Xiongnu, they had ousted the Saka in Bactria - the Seleucid Greek city of Ai Khanum had been devastated first by the Saka and then by the Yuezhi. The Kushans had adopted the Greek alphabet for their language (and even added a new letter for the sh sound in Kushan). They had grown very rich on the trade between China, India and the Roman empire. Under their most successful ruler, Kanishka I (c.AD 127 - 140) they had expanded into most of northern India and Pakistan. Art and architecture flourished. He converted to Buddhism, which had been introduced from India, and was responsible for its onward transmission along the Silk Route to China. Ardashir I had not felt strong enough to take them on militarily - and had bribed them to leave him alone. But sooner of later the eastern territories - once part of the Achaemenid empire, and Iranian in language and culture, would have to be properly dealt with by the new Persian empire-builders. Shapur's first job as king of kings was to challenge the Kushan rule. He invaded their territory via Sistan and the Indus valley, aiming for the Kushan winter capital at modern Peshawar in northern Pakistan. Having taken Peshawar he pushed further north over the Hindu Kush into Bactria and onwards. The western Kushan rulers were deposed and replaced by a vassal state, subject to Persia, known as the Sasanshahs (or Indo-Sasanians). The Indian half of their empire was eventually absorbed by the Guptas in the 4th century. More here. Shapur I recorded his victories over the Kushans at Naqsh-i Rustam, close to the tombs of his Achaemenid predecessors (see next page). Soon he would have even more important conquests to add to his list. Shapur I's reuniting the western regions of Iran with the eastern areas where Iranian languages and culture had long been dominant had important results. These had been the heartlands of Zoroastrianism, and the focus of a national history of the Iranian people which had no connection with the ancient glory of the Achaemenids, whose memory had already faded. In its place came legends of the Pishdadians and the Kayanians - an alternative history which soon became the national narrative. NEXT: SHAPUR I TURNS WEST - THE NEXT VICTIM AWAITS. against the huge and wealthy Kushan empire in Afghanistan, Pakistan and India. Kanishka started off using actual (rather bad) Greek - but later coins and inscriptions are in Bactrian (an Iranian language), but still using the Greek alphabet. Likewise Iranian and Indian gods replace Greek ones on the coins - although only a few have BODDO (Buddha).